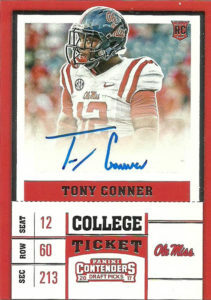 Tony Conner played strong safety for Ole Miss. He had standout years as a Freshman and as a Sophomore, earning Freshman All-American Honors. After starting 28 consecutive games for the Rebels, Conner had a knee injury and two surgeries that limited he to five games in his junior season. Tony rebounded in 2016 and started all 12 games for Ole Miss as a senior. An in the box safety who is a good tackler and run supporter, Tony had only two interceptions and 13 pass breakups over his career at Ole Miss. He went unselected during the 2017 NFL Draft. Tony was given a tryout at minicamp by the 49ers and the team moved him to linebacker. He was invited to camp after that but did not make the squad. Tony might make a nice fit for one of the new spring leagues picking up steam in the next two years- as at this time he is a free agent.